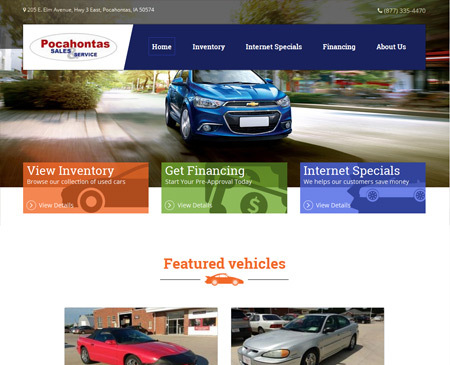 Pocahontas Auto Sales, a prominent used car dealership in Pocahontas, IA, has employed AutoJini for their new website implementation, search engine optimization, Facebook Applications, and Social Media sites setup. Pocahontas Auto Sales has selected AutoJini.com to implement their dealership's innovative website using the Content Management System of AutoJini. AutoJini will be in charge of not only preserving the dealership website but also providing consulting services to evaluate and monitor the performance of this new website, its traffic, and conversion of the new site's traffic to leads. "Some companies provide only websites for auto dealer while some provide services but AutoJini provides not only web sites, it also provides bunch of add-on to enhance the web site. It also provides, SEO services, PPC and Facebook Ad management services. They also provide on-request consulting services to review our web site's performance, they offer feedback on our internal SEO efforts, and any other question we may have about constantly growing online market share. They add a personal touch to the process with a friendly staff that is there every step of the way." said Jeff Schneider, owner of Pocahontas Sales & Service. AutoJini is a web-based software suite of solutions used by automobile dealers across North America. AutoJini services include the development and implementation of dealership websites, mobile websites, micro sites, Facebook applications, inventory management solutions, data export to 3rd parties, search engine optimization (SEO), PPC campaign Management, eBay Motors Auction Tool, social media marketing (SEM), and news & blog software. For more information, please contact Mr. Syed Azam by phone (515) 232-2024 or email syed@AutoJini.com Visit www.AutoJini.com for more details. Pocahontas Auto Sales is located Pocahontas, IA. Pocahontas Auto Sales offers a wide-ranging inventory vehicles, weekly specials, customer reviews, and an easy to use Contact Us section all on their newly designed website. Comments 0 Response to "Pocahontas Auto Sales and AutoJini.com signed agreement for its new website"